Nachi America's Cutting Tool Division produces drills, endmills and taps designed to meet and exceed the exacting requirements of the industry's highest-precision machine tools. Nachi has long been a pioneer not only in tool design but in coatings that add durability and extend cutting life. Our tools are built to perform with precision and provide our customers with efficient, cost-effective solutions. 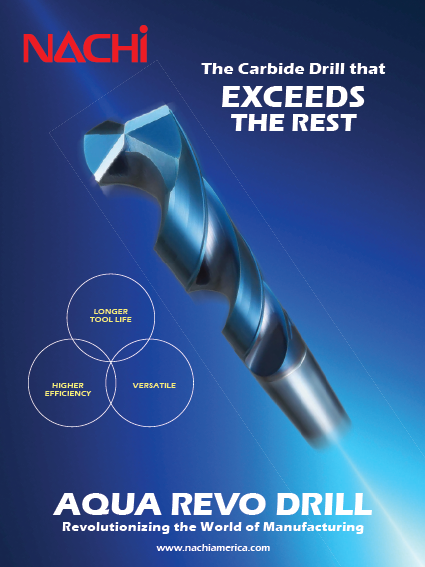 Nachi has launched a new series of AQUA REVO Drills that is Revolutionizing the World of Product Manufacturing. CLICK HERE to see our latest brochure. ISA is the product of a consolidation between the Industrial Supply Manufacturers Association (ISMA) and the Industrial Distribution Association (I.D.A.). All active members of both ISMA or I.D.A have now been rolled over into ISA. Click here to find local sales representative.